Salt Spray Chambers – Hastest Solutions, Inc.
Environmental test chambers evaluate product quality and reliability, and identify manufacturing flaws and weaknesses in those products before they are released to the general market. The test results recorded through the process of salt spray testing can show the process of product decay and degradation and help predict the potential lifespan of a product or coating. Within the sealed test chamber, a salt-laden spray or a salt-fog (mainly sodium-chloride) is produced by a high-pressure nozzle to check the corrosion resistance of product coatings or coverings for products usually made from steel, brass, and other metals. The metal object is normally hung from a rod or hook in order to expose the most surface area possible for testing purposes. As most metals are highly susceptible to corrosion, protective coatings are often used as a barrier between the metal and the exposure to salt spray and fog. Coatings which are often tested in salt spray test chambers include phosphate surfaces, zinc and zinc alloy platings, electroplating with chromium, copper and tin, organic coatings, and certain painted coatings. Industries which rely on salt spray testing include automotive, construction, aerospace, and industrial. The process of salt spray testing is relatively cheap, quicker than other forms of environmental testing, and reasonably repeatable. Yet, replicating corrosion is complicated due to the susceptibility of it being further affected by other external factors. Therefore, the test results and the predicted lifespan of a material may not be completely accurate, and so the design and construction of the salt spray test chamber needs to be carefully considered. Industry standards in terms of size, test duration, and procedure need to be understood and met before undergoing testing. Salt chambers are typically approximately fifteen cubic feet, and yet larger custom designed chambers can be made too. Using a pressurized supply of salt-spray or fog leads to an accelerated rate of corrosion in objects and therefore testing time can vary from taking a few minutes to a number of days depending on the type and detail of data required. Testing can be a costly procedure depending on the size and process undertaken, and yet it is a wise manufacturing choice to undergo environmental testing, especially in terms of long-term expenditure and future benefit. 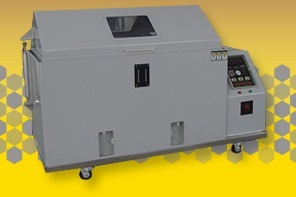 Salt Spray Chambers Salt spray test chambers are used to test a product or material in a highly corrosive environment for the purposes of evaluating the long-term effects of salt on an object and its ability to withstand the effects of corrosion.